When all communication with a remote military base situated in an area of intense guerrilla activity is lost, a unit of Colombian soldiers is sent on a mission to regain contact with their brothers-in-arms. Fearing the base has been taken over by enemy forces, they arrive to find the place seemingly devoid of life. Once power is restored to the outpost, the full horror of the situation is revealed – the place is littered with corpses, the walls daubed with blood and what appear to be magical symbols intended to ward off evil. Amidst the carnage the soldiers discover a woman buried alive behind one of the walls. The dead captain's log reveals she had been captured in the area several days earlier and was being held on suspicion of being a guerrilla informant. Further interrogation of the woman reveals little, but soon leads to tensions amongst the men who are struggling to come to terms with the mysterious slaughter of their comrades. Confused and isolated, the soldiers find themselves gripped by inexplicable feelings of fear, mistrust and paranoia that leads them to question the nature and identity of their enemy. Sound familiar? It certainly did to us, this being effectively the same setup as Kong Su-chang's 2008 Korean horror/war crossover movie G.P. 506, aka Guard Post. But advance word on Jaime Osorio Marquez's debut feature has been very positive, including from quarters who know their horror films well enough to jump straight on a rip-off. Indeed, genre specialists Fangoria called it "an incredibly atmospheric work" and "a startling and memorable first feature," while Twitch assure us that "Jamie Osorio Marquez creates an incredibly tense and claustrophobic atmosphere." Expect a review soon. 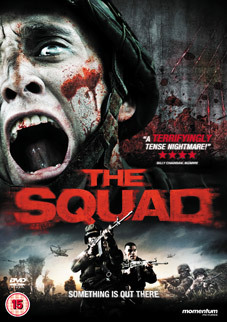 The Squad (El páramo) will be released on UK DVD on 18th June 2012 by Momentum Pictures at a yet to be confirmed retail price. We're still awaiting details on what extras might be included.